Transportation management in a distribution agency requires streamlined processes due to a large amount of data and complex logistics procedures. Programs such as automation and advanced data input programs are used to handle complex analysis and computational tasks. However, it should be considered that these programs require a sturdy computing technology to last in the harsh conditions of the distribution industry. Also, a fulfilment floor may have limited workspace to accommodate computing devices. 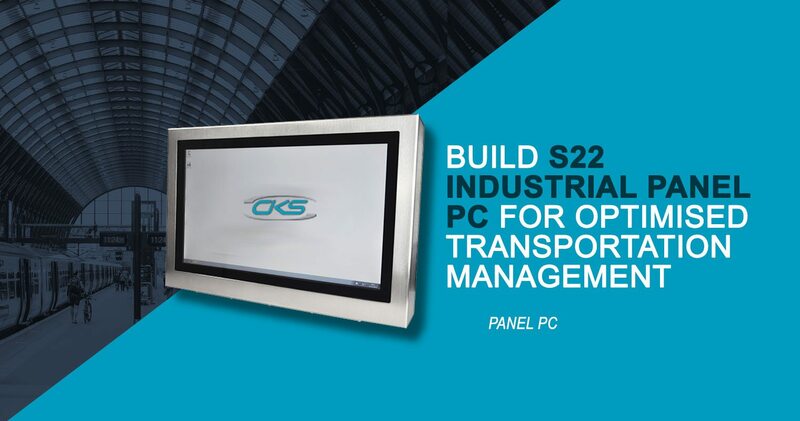 Hence, the ideal device for optimising transportation management is through an S22 industrial panel PC. Why is it this type of device ideal for logistics and distribution industry use? And how can it optimise a transportation management? Read on to learn about the features of S22 panel PC and its benefits to logistics operations. Transportation Management in the distribution industry means planning, coordinating, and analysing proper transportation routes and procedures. This operation in the industry entails a fast-paced and organized workflow. But, its working environment has potential risks such as varying degrees of temperature, shock, dust, dirt, vibration. For this reason, installing a 22-inch panel PC either standalone or in conjunction with other machinery can enhance transportation management. Its IP69k and NEMA 4 sealing offer protection from intrusive contaminants and other environmental hazards. Thus, these devices can help in improving transportation management despite the presence of these damaging conditions. Note that not all industrial computers are created equal. It bears different key features, specifications and benefits. For TMS, one of the most recommended computing technology is the S22 panel computer. In logistics operations, operators mostly wear gloves for safety purposes so certain touchscreens are not responsive to gloved fingers. But, an advanced rugged panel PC that has screens with a projected capacitance technology offers an optimal way to navigate the screen’s interface. It can detect multiple touch points whilst remaining responsive even with gloved fingers. Plus, it provides excellent scratch resistance to the device’s screen. This 22-inch panel PC has a wide display which allows great viewability. It also has a compact structure which makes it convenient to install in many aspects of a TMS. Furthermore, its high brightness display makes it readable even in tough ambient situations. The 24/7 heavy data influx poses a potential risk of overheating which can cause hardware failure. In a fulfilment floor, there will be varying temperature degrees and humidity that can damage a commercial-grade computer. Thus, a 22” rugged panel PC is equipped with a reliable thermal control system consisting of an internal heater and external waterproof fan. This will ensure that the device can provide optimum output amidst varying temperatures. An industrial-grade sealing protection is a guarantee that the device can withstand certain degrees of damages from contaminants. As a result, it can last in the fulfilment floor of a distribution agency whilst providing convenience in operations. Therefore, such kind of features of an S22 panel computer is ideal for an efficient TMS in the distribution industry. Transportation Management System in the distribution industry has many integrated logistics tasks. This can be a daunting responsibility which can become complicated without proper computing technologies. Given these points, S22 ruggedised panel PCs are excellent for TMS usage. It can last under extreme conditions and its industrial-grade components can further enhance efficiency in the transport management operations. Find a trusted industrial computer manufacturer today to assist in building and customising a 22-inch industrial panel PC fit for transportation management needs.